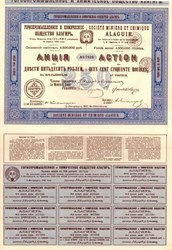 Beautifully engraved Certificate from the Societe Miniere et Chimique Alaguir issued in 1896. This historic document was has an ornate border around it and has 11 unused coupons attached on the bottom. It is over 113 years old.